If you have an active toddler who loves any kind of sport, then you’ll love our list of the best sports toys for 2 year olds and up as it covers a host of fun and engaging toys for your child to enjoy! Young children love a challenge and they love learning a new skill, so what better way to encourage them than by introducing them to various sports toys designed specifically with toddlers in mind. From balls to combination playsets, we’ve researched and found the best sports toys for a 2 year old toddler and all of them are suitable for both girls and boys. We’re confident you’ll find something special for your child. If you are looking for a toy that allows open ended play for your two year old toddler or pre-schooler, then these Gonge River Stones may be the ideal toy. These river stones are made of hard sturdy plastic that comes in a set of 6 – 3 large stones, and 3 small stones. The sides of the stones vary in steepness and difficulty. Each stone is rubber rimmed to better grip the floor to prevent sliding when your child steps from stone to stone or jumps from stone to stone. The stones are designed for children age 3 through 7, but parents find that these stones work well for children as young as 2 and up to any age, as long as the child (or adult) weighs under 110 pounds. 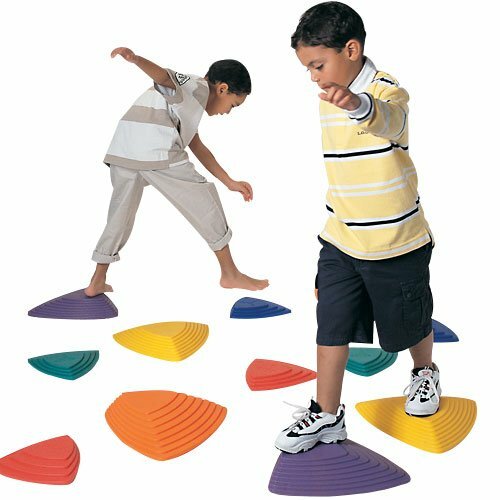 While these stones are designed to improve your child’s coordination and balance, they are great for open ended play, as children use them in a number of different ways. Best of all you can increase the difficulty for your child using these stones by spacing them further apart. These river stones can be used indoors or out, and when not in use they can be easily stored because they nest one in another. Once your child masters the skills to enable them to jump from stone to stone, you can increase this set by adding the Gonge Hilltop Stones. These stones are different colors which you can also use to help your child learn to identify colors or use to learn how to count. Gonge riverstones are a great open ended toys that your child can use in any number of ways including active play in jumping from stone to stone. If you have an active toddler or pre-schooler who becomes frustrated by the inactivity of being shut indoors during rainy or cold weather, then this Betheaces Kids Toy Soccer Goal Set with Hover Football may be the ideal toy that allows your 2 year old to remain active even when shut indoors for days at a time. Made from non-toxic plastic, this soccer set comes with two goals measuring 19” X 10” X 10” and a hover football. The Hover football moves like an air hockey disc and needs 4AA batteries to activate colored lights. It also makes sounds and has a foam edge that forms to protect walls and furniture. It also comes with a one year 100% guarantee. This soccer set works best on wooden or linoneleum floors indoors or on polished concrete. It will also work on low pile carpeting. 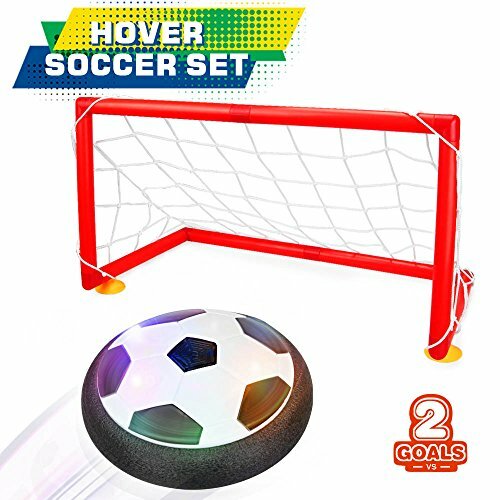 The soccer game with the Hover Football is designed for children 3 years old and up, but the hover ball moves so easily that children as young as 2 years old can kick this ball at the goal. The Betheaces Soccer Goal Set and Hover Football is a great way to bring an outdoor sport indoors to keep children occupied on those rainy or cold days. Children of all ages, and even parents, find this game set fantastic fun! 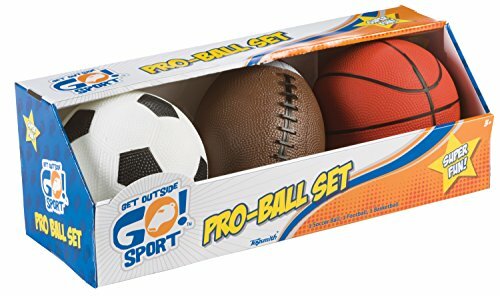 If you are looking for a simple way to introduce your toddler to the world of sports as a means of helping them burn off some of that excess energy, then this Pack of 3 Get Outside Go Pro Ball Set may be ideal. This set features a 5” soccer ball, a 6.5 inch football, and a 5” basketball. The balls are made for indoor or outdoor use and are recommended for children age 3 to 15, although they are much better suited for children ages 1 to 4 or 5. These balls are made from a soft rubber-like plastic and come already inflated, but you can re-inflate them if they lose air overtime. The little basketball is the right size to go with the Little Tikes Basketball set. This ball set will help your child build kicking, bouncing, throwing and running skills, while it strengthens their gross muscles and keeps them happily occupied out of doors. They are small enough and light enough that they can be used in the house, although you may want to designate a play area just to keep knick knacks safe from being knocked over. This ball set is sure to keep your toddler happily playing outside while building strong muscles and developing skills needed to engage in sports as they grow older. Perfect sports travel toy for taking to the part, going camping and lots more! 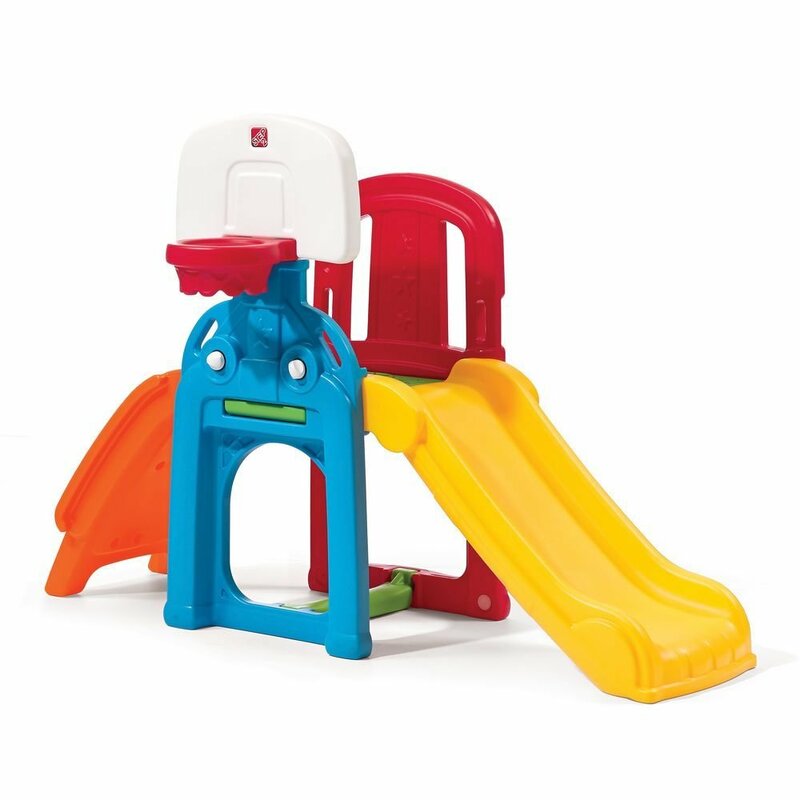 The Step 2 Game Time Sports Climber and Slide is a compact play set that should keep small toddlers happily occupied for long periods of time. This sports climber consists of steps that are designed to help your child gain their climbing skills. There is also a slide, a basketball hoop, and a scoreboard that your child can keep score turning clicking knobs. There is also a crawl through wall that your two year old can use as soccer goal. The set comes with a basketball, and is recommended for children ages 2 to 6 years but suitable for children as young as 1 year old. It will hold weight up to 60 pounds. The entire Sports Climber and Slide measures 5’3” X 3′ 7” X 2’6” making it compact enough for small yards or even indoor use. This is a great toy for toddlers, providing them with a number of activities that will allow them to explore, build gross motor skills, and engage in play that helps them to insert a bit of independence. But we do advise that you supervise your young toddlers when playing with this toy until they have mastered the play set. If you have an active toddler who loves climbing on everything then this Step 2 Game Time Sports Climber and Slide may well be the perfect play set to keep them occupied while building important skills. Climbing and sliding is wonderful fun for toddlers and they will thoroughly enjoy it! If you or someone in your family plays tennis, then there is a good chance that your 2 year old toddler will want to play too, which is why the Street Tennis Club make Tennis Rackets the perfect size for small children. This Street Tennis Club Tennis Racket comes in sizes 17 inches, 19 inches, and 21 inches, making these rackets perfect for smaller children. The 17 inch racket is perfect for children ages 2-5 and fits in their hand well, and is shorter to help them be able to actually hit more balls as it has more control. 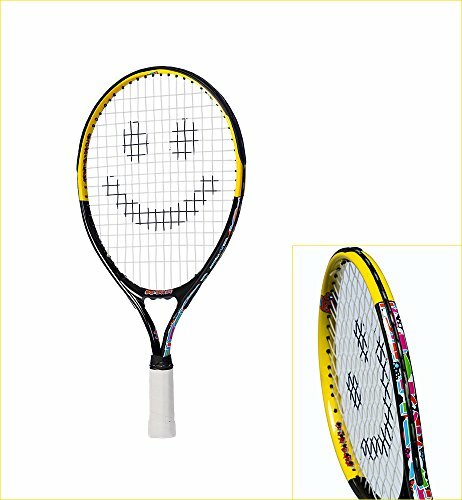 Made from high quality aluminum, this tennis racket comes in a choice of black/yellow or pink/white and has a smiley face in the center to make it more fun and appealing for small children. These are real tennis rackets that are just made in a size suitable for small children. Most parents who purchase a tennis racket for their 2 or 3 year old start out by simply tossing a tennis ball and allowing their toddler to the hit the ball back to them. It makes for great bonding time between parent and child or older and younger sibling. This tennis racket comes with a free video game that covers some of the fundamentals of tennis. The Street Tennis Club Tennis Racket for kids is a great way to give your child an early start on learning the basics of playing tennis. Toddlers love trying to hit balls with different objects, so this tennis racket is perfect for providing them with lots of fun! 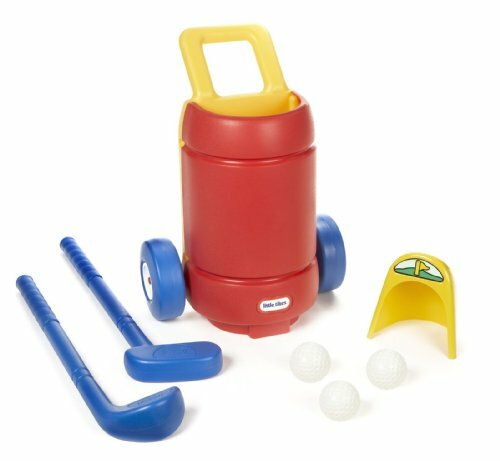 Childhood is a time for children to explore different hobbies and interests and this Little Tikes Totsports Easy Hit Golf Set allows toddlers as young as 2 to explore the hobby of golf. This golf set comes with an all surface putting hole, 2 clubs, 3 golf balls and a cute little plastic cart with wheels. The sports golf set provides a great way for your little one to play putt-putt golf in their own backyard. Although this golf set is either recommended for children 1-6 or 2-6 depending on where you get your information from, most parents find that it works best for children ages 18 months to about 5 years. This brightly colored golf set is designed for children to be able to use whether they are right or left handed, and everything can be stored in with the clubs inside the bag and the balls on the side. The great thing about this golf set is that most toddlers don’t just use it to play golf. Some children use the cute little cart to load other toys inside and haul them around! But eventually, children become interested in trying to hit the ball with the golf club and feel a real sense of accomplishment when they get it into the ‘hole’! This Little Tikes golf set is a great addition for anyone looking for outdoor sports activities for kids. From the wheeled golf cart to the sturdy little golf clubs, this set offers small children hours of golfing fun! If you have a 2 year old, then you know how energetic they can be, with your little one practically bouncing off the walls in his or her exuberance. This Space Hopper Ball can allow your child bounce to his or her heart’s content. 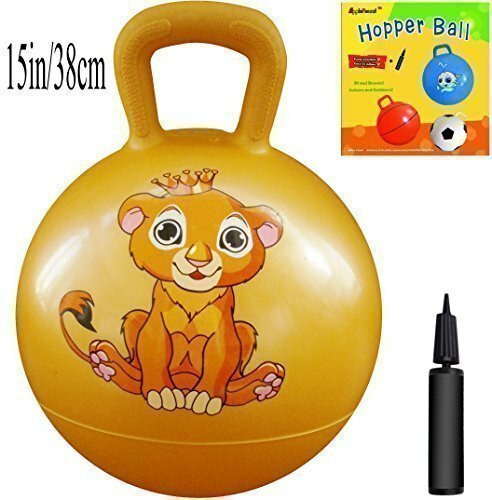 This Space Hopper Ball is recommended for children age 3 to 5, but several parents shared that this hopper ball works perfectly for their two year old. Although small in size for older children, it will bear up to 160 pounds. This ball has a nice large handle for your child to hang onto and is made of thick and durable inflatable material. It does not come inflated, but there is an air pump that comes with it so you can pump it up to the size needed. Once blown up this ball is 15 inches in diameter. While this ball will help your child develop gross motor skills, balance and stamina, your toddler won’t care about that, they will just find it fun bouncing around the house from one place to another. If you plan on using this Space Hopper ball out of doors, then make sure you use it on grass that is free of sticks and sharp stones that could cause a puncture. Your child will spend hours of happy times with this space hopper ball while enjoying some fun exercise and getting rid of some of their pent up energy. Your little one will have a blast bouncing on this ball! This Little Tikes T-Ball Set comes with 5 white plastic balls to bat, a yellow bat, and a red and blue stand. The T itself is supposed to be adjustable, but several parents shared that it does not adjust so worth noting. Made entirely of plastic, this T-ball set is designed for children ages 18 months to 6 years so perfect for your 2 year old girl or boy to play with. The T is specifically designed to hang on the wall while holding the bat and two of the balls, which makes storing this set easy. This T-ball set is perfect for children too young to join actual T-ball or for young children who want to practice batting at home and improve their motor skills and coordination. Younger children can use the T while somewhat older children can use the bat and the ball without the T, just to practice some batting skills. Both the ball and the bat is somewhat large, with the bat also being shorter than most bats so young children have a better chance of hitting the ball and can have more control over their swing since the bat is sized for them. This T-ball set makes for a great backyard toy that your child can play with alone or with other toddler friends. This Little Tikes T-Ball Set makes a great outdoor sports toy for toddlers and preschoolers to provide them with fun and a great introduction to sports. 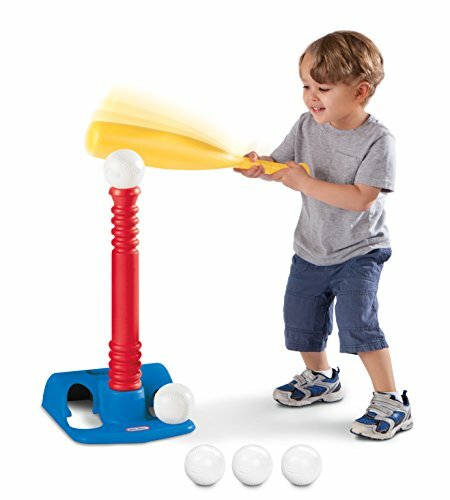 Toddlers and pre-schoolers will find hitting the ball off T great fun! Most children of all different ages seem to want to try their hand at shooting baskets at one time or another. This Step2 Shootin’ Hoops Pro Basketball Set is designed for children ages 2 to 8 years and can provide years of fun for your child. 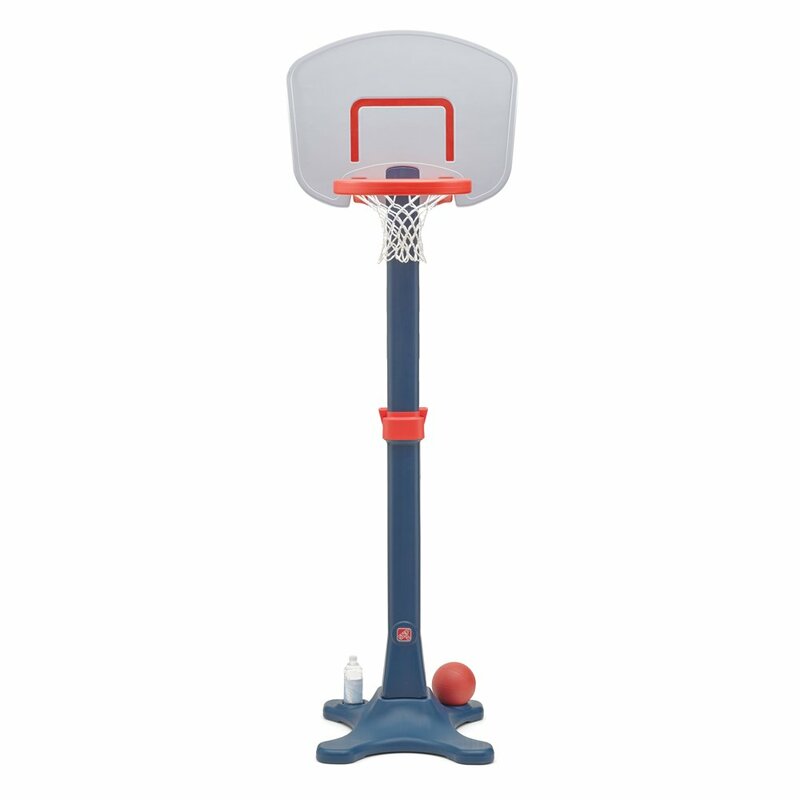 The center pole of this basketball set can be adjusted from 48 inches to 60 inches and to 72 inches. It features a large backboard with a break away rim and woven net. It also has a large stable base that can be filled with water and sand to make it sturdier. There is also a built in cup holder in the base and it comes with a 6 inch basketball. This basketball set is fun for toddlers and most parents note that even their pre-teens and teens enjoy playing with younger children using this set. Some people even bring this basketball set indoors during the colder months. The basketball that comes with the Step2 Hoops Pro Set is fairly soft and smaller than a normal sized basketball, but is designed specifically to be used with this set. It’s the perfect size to be used by small hands, making it easier for todlers to use and to throw than a full size basketball. Start your child’s interest in basketball out right with this Step 2 Shootin’ Hoops Pro Basketball set. This set of Dazzling Toys Sports Balls Set come in a package of 12 x 2 ½ inch balls. There are 3 of each soccer ball, basketball, football and baseball. The balls themselves are made out of foam with a light plastic cover. While these little balls are recommended for children ages 3 years and up, many parents find they are suitable for 2 year olds who no longer chew on everything in sight. 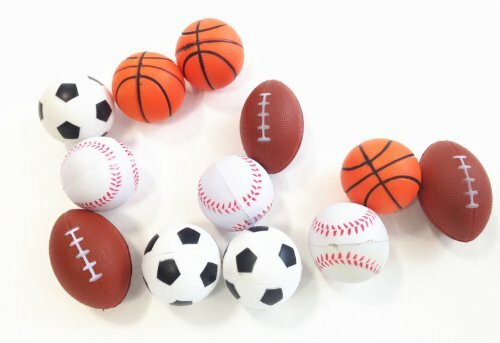 These balls are extremely small, making them too small to actually use for sports, but are great for children to play throwing games or simply carry around. Reviews for these balls indicate that parents purchase them as centerpieces and goodie bags for child’s birthday parties, stocking stuffers, a non-food item in Easter baskets, rewards for good behavior and many other things. Due to the soft nature and the small size of these balls, they are also great for squeezing to improve hand strength and to help relieve stress and anxiety. These make great toys for indoor play, for in the tub or the kiddie pool, and to give away as gifts. These small foam balls are the perfect gift for toddlers to introduce them to throwing and catching without worry of them getting hurt if they miss their catch.